In case you missed it, April was National Pet First Aid Awareness month. But for those who love their pets, first aid awareness should be celebrated daily! That’s why we’re happy to share this helpful information compiled by VCA Animal Hospitals regarding what to do in the event your three (or four) legged friend gets injured. Whether it’s a leaking seroma, broken bone, cut paw, heat stroke or if your pet suddenly stops breathing, emergency situations can arise at unexpected times and it’s important, as a pet-owner, to know what to do. 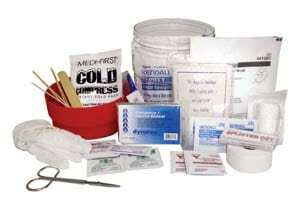 The information details Pet First Aid tips including instructions on how to perform CPR on pets, as well as various recommended pet first aid kits to have on hand. While no one can be prepared for all emergencies, there are some simple guidelines you should follow and things to look for if your pet seems ill or is involved in an accident. This knowledge may just save your pet’s life. If your pet is injured, it’s likely they will be panicked or disoriented. The stress of an emergency involving a pet or owner can cause an otherwise friendly animal to act aggressively. It is important to ensure the safety of all rescue personnel that are attempting to assist with an injured animal by keeping everyone calm, including your pet. For a small dog, put it into its carrier (remove the top for easy and safe access to the carrier; don’t push an injured dog through the small door or opening), or use a suitable container such as a strong cardboard box. For a larger dog, use a makeshift stretcher made out of some rigid material such as an appropriate sized, sturdy piece of wood. Carefully maneuver the dog onto a blanket or coat so that it can be gently moved to the carrier, box or stretcher. The blanket will help stabilize the neck and spine, and prevent inadvertent biting or scratching from the injured pet. To safely move or transport an injured cat, use suitable container such as a strong cardboard box or a cat carrier (remove the top for easy and safe access to the carrier; don’t push an injured cat through the small door or opening). Drop a blanket or thick towel over the patient. Tuck it in carefully or maneuver the cat onto the blanket so it can be gently placed in the container. The blanket will help stabilize the neck and spine and prevent inadvertent clawing or scratching from the injured pet. Although frightening to think about, when pets become unconscious or stop breathing due to heat stroke or a variety of other reasons, it’s important to know what to do. At the first sign of trouble, all attempts to get to a veterinarian should be made, but knowing basic cardiopulmonary resuscitation (CPR) techniques may help you save your pet’s life until veterinary help is available. A: Open the AIRWAY. Extend their head and neck (by lifting his/her chin) for the best possible breathing position. It is important to check for a breathing obstruction. Open their mouth, look in the back of the throat and grab the tongue and pull it outward. If an object is blocking their throat or airway, use your fingers or a grasping instrument (pliers, etc) to remove it. Only perform this maneuver if your pet is unconscious — otherwise you may be bitten badly. If the object cannot be reached or pulled out, use the Heimlich maneuver to try to dislodge the object. B: Check for BREATHING. Watch for the rise and fall of the chest and feel for breath on your hand. A lack of breathing and oxygen will also cause your pet’s gums to appear bluish. C: Check for CIRCULATION. Place your fingers or hand on the left side of your pet’s chest—just behind the elbow—to feel for a heartbeat. You can also try to feel their pulse by pressing gently on the inside of the top of the hind leg. If there is a heartbeat or pulse, continue with rescue breathing only. If there is no heartbeat begin chest compressions also. Grasp your dog’s or cat’s muzzle (snout) and hold their mouth shut. Place your mouth completely over their nose and blow gently. Don’t blow too hard—just enough to cause their chest to expand normally. Wait for the air to leave the lungs before breathing again. Give 20 breaths per minute (one breath every 3 seconds) until your pet begins breathing on his/her own or as long as the heart beats. 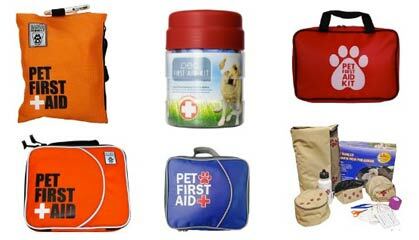 Shop Amazon to save on pet first aid kits for home and travel. For more information and to learn about other pet health updates, visit VCA on Facebook or go to VCAhospitals.com to locate the hospital nearest you.